No one now thinks about Stirling’s glory days as a pottery producing area, when in the 17th century, most of the earthenware for central Scotland and beyond was produced in the Throsk Pottery. The potters lived in the surrounding areas of Bandeath, Poppletrees and Cockspow, within the Barony of Cowie, and were known as pigmakers, ‘pig’ being the Scots word for pottery. The Stirling Smith has five Throsk jugs, and the National Museum has eleven, recovered from the Forth at Gargunnock, indicating a capsized boat load. Sherds of Throsk Pottery have been found throughout central Scotland, and some were uncovered in the failed Scottish colony of 1698 in Darien, Panama. With the concentration of pottery producing talent in the Stirling area, it was perhaps no accident that the first industrial pottery in Glasgow was set up by a Stirling man, William Maxwell in 1722. Until 28 May there is an exhibition at the Smith, showing the best of the contemporary work of the Scottish Potters Association. 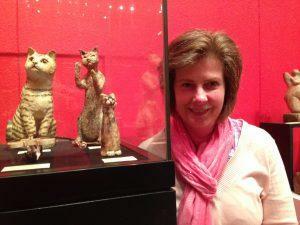 The SPA has only one Stirling member, Kathleen Morison, shown here with some of her work. Kathleen has worked in ceramics for four years, experimenting with alternative firing techniques, such as raku, and incorporating horsehair and feathers. She embraces the fun of imperfection and the joys of creativity, and calls her work ‘Wonky Pots’. There are 40 potters in total exhibiting in the Smith, offering the opportunity of finding a truly unique gift, wonky or otherwise, for that special occasion.